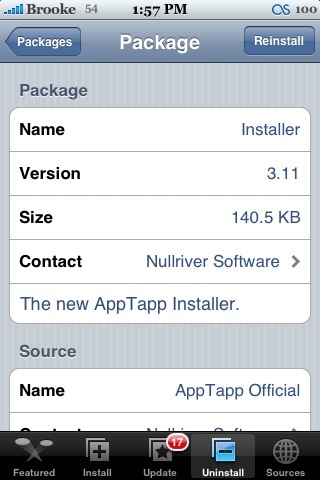 The update to Installer version 3.11 adds the search feature to the Uninstall Category. Which I think is great…there have been so many times when it would have been faster to search for an app then trying to find it somewhere in my Uninstall list! 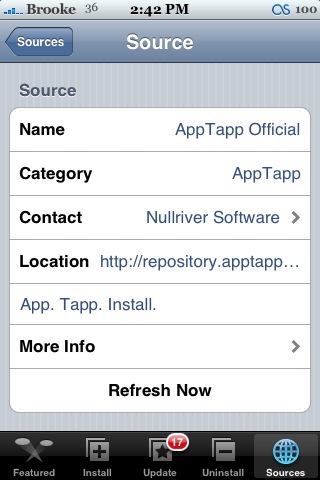 Update (thanks to cool_guy): Version 3.11 also allows you to refresh one source at a time! All you have to do is go into the Sources Category, select the source you would like to refresh and then select Refresh Now!! Very cool guys…props! Check out the screenshots below to see what it looks like. No way! Let me check…oh, you are soo right! I will add that to the post!! :D.. you guys are awesome! side note, winpwn was released today. no more beta people, a full on release. i hav d same problem, can u help me..? 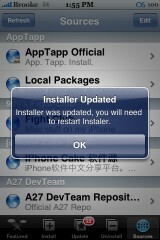 Also, Installer uses language-change-restart for relaunching the SpringBoard now. Very robust and reliable, indeed. Now Installer is finally getting closer to what will make it perfect. Should only be a solution for installing apps onto the Media partition instead of the system partition. um i have a jailbroken 1.1.4 ipod touch with ziphone, my instaler is verson 3.11 and i can do downloads fine but i cant add sources help me plz!!!!! * Ability to refresh one source at a time!! I also noticed that when you search for an application you can now see the last entry. Before, it didn’t let you scroll all the way down to select the last application in the results…now it does. @Brooke I also noticed that when you add a source it does not refresh all the sources, it only refreshes and gets the data from the one you just added. Good time saver! – Local install repository (~/Media/Installer). – Greatly improved sources refresh time. – Added packages filtering for easy searches. – Packages list is now separated by first letters for easier navigation. – Package description field text height is now dynamic. – Added check and an alert for effective user id == root. – Added proper platform name detection. – Featured page is being cached for faster startup and less network usage. – User-Agent being set to the Installer version and also contains platform name and firmware versions. – Source description cell height is now dynamic as well. – Single source refresh button in the source info. – Experimental version comparison algo to prevent update offers when package is present in multiple repositories (only invoked when the version can be decomposed using Apple’s default algorithm, for example, 1.0.3b2… won’t work on svn-123 or 1.22b4 versions). – Search field for the Uninstall section. – Adding a repository will only refresh it and not all of the sources. – Fixed an issue with permissions for the folders being created not getting proper permissions. – The section list table is now properly resized when keyboard appears/disappears. Same problem here… Package download failed… Any cures? Hi! I can’t install the update, I got message Error “Package download Failed!”, Any help to solve this? Thanks! 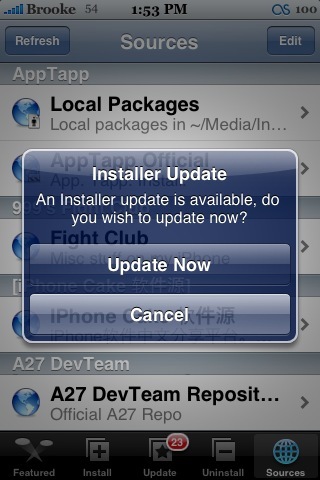 I’m not able to update my installer. When I click on update it tells me that it failed..
Is it only me or anyone else getting this? Hello, i have a problem i have read the above too update the installer to V3.11 but i seems everything i refresh the installer it hasn’t detected a new version..
Not sure if i am doing something wrong.. Please could someone help? I tried to updates my installer 3.1 to 3.11, but the messagebox came up with this message “Package download failed!” Any help? i also get package download failed when i try to update to 3.11. I’m running 1.1.4 used ziphone. and suid lib fix doesnt install , i get main script excution failed! please help. p.s love your site, keep up the good work. FYI. The 3.11 updates was installed already in my phone, I think the problem is the server itself, not in our phone. I am on 1.1.4 and installed installer 3.11 and everything was fine. 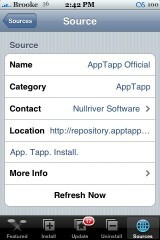 Now when I open installer it just shuts down and kicks me right back out to springboard. I am having the same thing happen as Parrish. Any clues? Is the server down since last night or did something go wrong that needs fixing after this update? Download Package Fail. PLease help ..
the installer was upgraded to 3.11 (version 1.1.4). 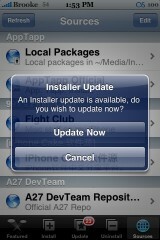 But now the installer uses wrong language (russian or somthing in stead of english or norwegian). 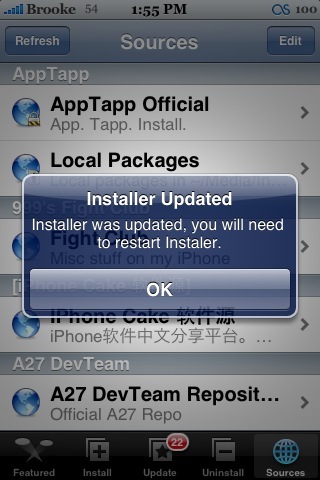 Is there som way to change the installers language. The rest of the iphone uses the correct language. Please help! Yeah i am on 1.1.3 by the way and in the meantime should we just restore? It really sux that I can’t uninstall or install anything. HELP!!! 4 some reason, my installer wont refresh soures when i add them! Like when i add a source, it says Refresh Failed!, and when i press refresh, it refreshes but th source i added is categorized as an uncategorized source…..
ive tried this with many sources (including famous ones) and i get the same result!!! SAME problem as above…can’t refresh or add STE source…can’t install OpenSSH!!! What do I need to install to split up the application icons in my springboard? I have a problem with my installer 3.11 that wasn’t there before. i’m running 1.1.4 and everything was fine for quite some time now, but the problem now is that whenever i install a new app, it downloads fine, then as soon as it starts installing, it kicks me back to springboard (main menu). same thing happens when i update apps from the update menu! any clues what caused this and how can i fix it please? 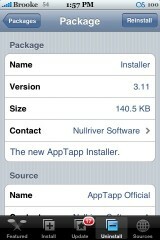 How do I install installer 3 after having jailbreaked my iphone? Hey,i updated my installer to 3.11 and from then on i found the following this happen.